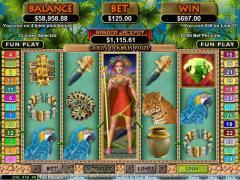 Mayan Queen is based on the theme of the ancient wealthy Mayan kingdom. The symbols on the reels display items from that era. The wild symbol is the Mayan Queen and the scatter symbol is the Emerald. The other symbols are the Pyramid, the Cheetah, the Treasure, the Idol, the Portrait, the Snake, the Parrot, the Bracelet, the Urn and the Dagger. All symbols are exquisitely crafted according to the Mayan theme. The absence of the high value cards allows the use of more Mayan symbols and this creates a greater impact. The background to the reels and the styling of the fonts are also in consonance with the theme. The coin size varies from 0.01 to 5.00. There are a large number of stops in the lower part of the range, which will help the low rollers. The coin size is selected by operating the Up and Down arrows next to the Bet button. Mayan Queen offers up to 25 paylines. The number of paylines can be selected by operating the Up and Down arrows next to the Lines button. Players do not have any choice in the number of coins per payline. It is fixed at one coin. The Mayan Queen appears only on reel 3 as an expanding wild symbol. The unique facet about this is that it substitutes for the scatter symbol as well. Usually in online slot games this is not the case. However the expanded symbol counts only for one scatter symbol. 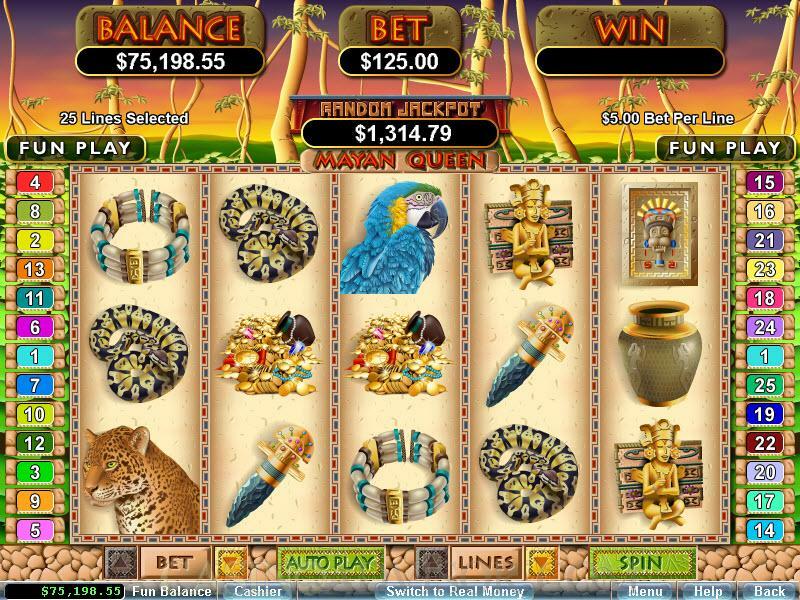 The Mayan Queen also acts as a multiplier and doubles all payouts. 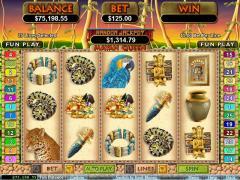 Two or more scatter symbols anywhere on the reels offer scatter payouts. Five scatter Emeralds offer a payout of 500 coins that are multiplied by the total bet. Three or more scatter symbols trigger the free spins bonus round. The scene on the reels turns from a day scene to a night scene. 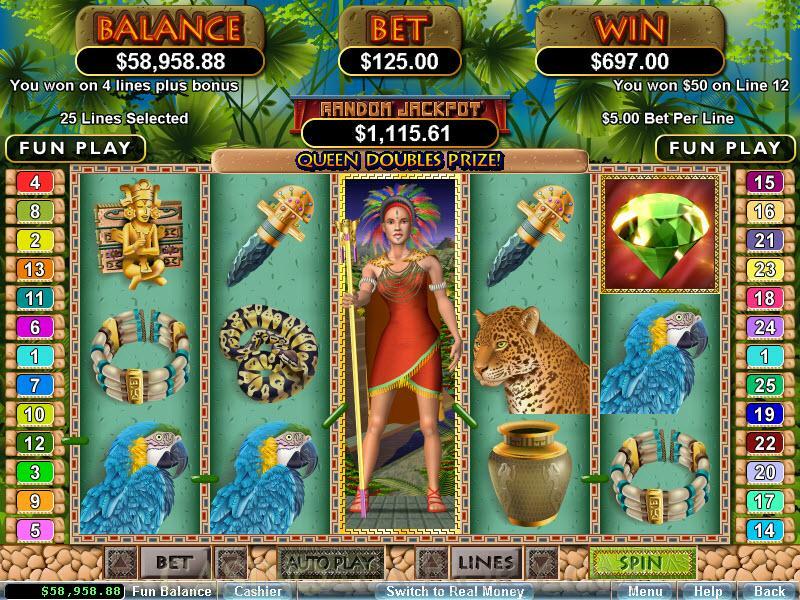 Six free spins are awarded in this feature with the Mayan Queen remaining in her expanded form across reel three acting as a wild symbol and doubling payouts. The free spins can be re-triggered. Interested in reading more detailed information about Mayan Queen? If so Click Here for more details.